To gain accreditation, healthcare organizations must demonstrate acceptable compliance with all standards and achieve a minimal numerical score on these standards as identified in the decision rules. These accreditation decisions are based on whether the organization meets the decision rules. Accredited organizations receive an Approved Survey Report, letter and certificate. The report indicates the level of compliance with AACI standards achieved by the organization. 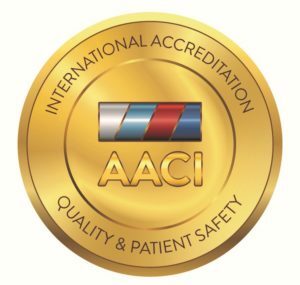 Meeting AACI Accreditation Standards is an accomplishment recognized by the award of an AACI Gold Medal of Accreditation. Accreditation is valid until withdrawn, or as long as the healthcare organisation meets the requirements of International Accreditation Standard.